Reporters have the opportunity to take a complex information and unpack it in a way that an audience can understand. It requires creativity, detail and an understanding of what readers need. William E. Blundell, former Wall Street Journal reporter and editor, relies on the use of a central theme when writing an explanatory piece. For Bludell, this means taking the point trying to be made and presenting it to readers in a variety of ways. Although it is tempting to place all of the interesting information about a topic at the beginning of a piece, it is a good idea to try to hold back some information and save it for a later point in the article. According to Peter Rinearson, former aviation reporter, it is important to fill each article with pieces of information that are fresh, new and interesting, filtering it throughout. 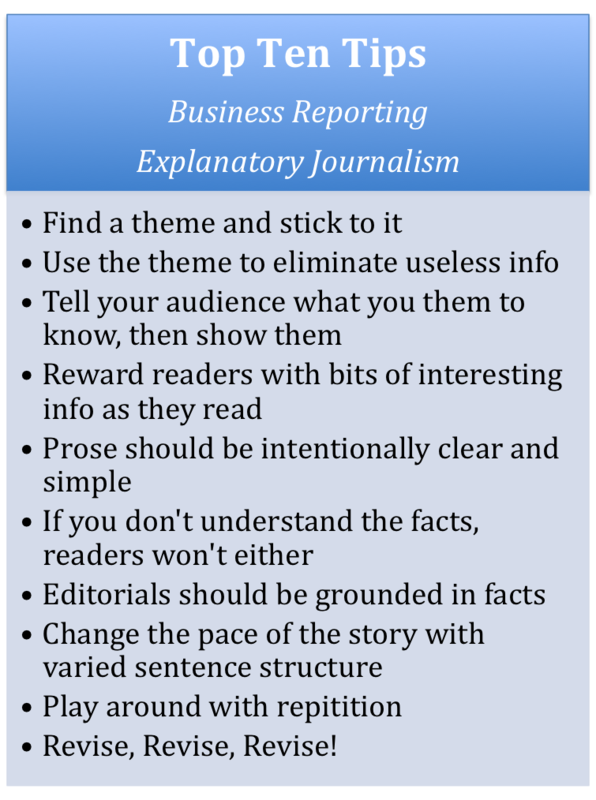 Seeking to provide a change of pace within an explanatory or business piece will allow a reporter to keep from writing long, overwhelming sentences packed with information that is difficult to comprehend. Michael Gartner, who has won awards for his editorial writing, suggests use one- and two-word sentences, which gives pieces a unique, engaging flow. The Wall Street Journal’s Kevin Helliker displays the power personal anecdotes can have through his work titled “Which Test Should You Get?” The article, discussing the types of tests one should take to reduce their risk of having an aneurysms, is strung together with the use of a personal story. Similarly, Helliker uses varied sentence structure, similar to that of Michael Gartner, which eases the reading process. Reardon won a Pulitzer Prize for explanatory journalism in 2011. Photo by Burnham Plan Cennital. Greeta Anand and Randall Smith’s “Trial Heat” is an example of how important it is for a writer to fully understand the content they are writing about. If the writer does not have an extensive knowledge of the content, the readers will be unable to follow what is being said. In this piece, the information is clear and concise, and at the same time, is filled with narrative elements that also keep things moving. “When weather turns bad, runways not as accommodating,” written by Patrick T. Reardon for the Chicago Tribune, is an example of clear, intentional prose. The piece, which focuses on the way weather affects runways in O’Hare International Airport, is filled with simple, clear language, which allows readers to understand jargon and technical language. Within explanatory writing, helping the reader understand can involve selecting a specific example to illustrate the point trying to be made. “The French Fry Connection” uses the example of the local potato industry to illustrate how the Asian economic crisis in 1999 was affecting things domestically.